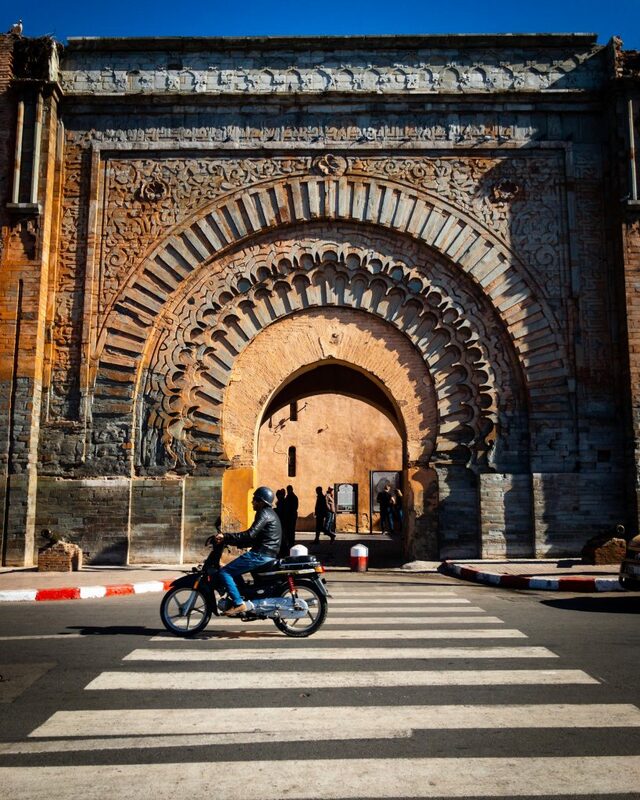 Bab Agnaou: one of the gates in Marrakesh’s defensive wall. Thanks to Kuba for this photo. 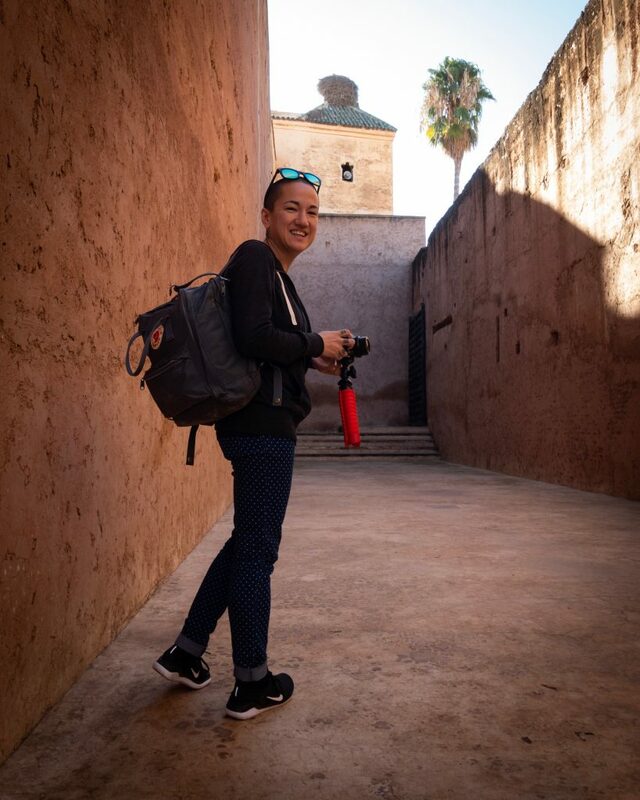 Thanks to reasonably priced RyanAir flights from Kraków, we had the chance to visit sunny Marrakesh for a week just before the end of the year. If you ask me, escaping winter in Poland is the perfect way to spend the holidays. Marrakesh is unlike any other place I’ve visited. It’s a vibrant, bustling city full of surprises. Now I’m ready to explore the rest of Morocco! 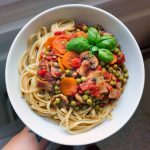 In this post, I share my 12 tips for first-time travellers to Marrakesh in case you also want to avoid winter (or maybe you just want to eat Moroccan food—also perfectly valid). We spent five nights in a hostel right in the Medina (meaning the old town part of the city encircled by defensive walls). For the other two nights, we stayed in an Airbnb apartment just outside the Medina. Both accommodations were conveniently located, comfortable for short stays, and affordable. 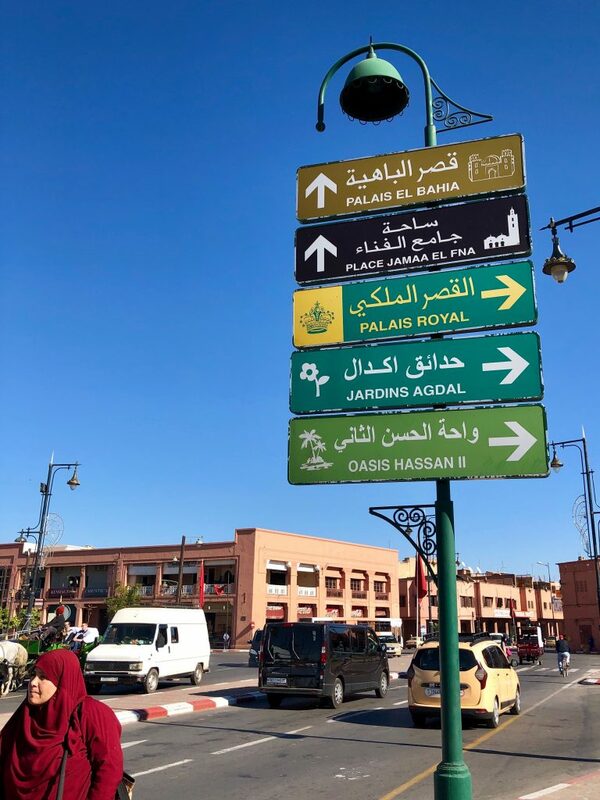 Staying inside the Medina is convenient because you’re right in the middle of everything, close to lots of cool cafes, markets, and other cool attractions. The Medina is pretty chaotic, which isn’t necessarily a negative but it means you can’t go anywhere without navigating through the maze-like alleys. In some areas, these alleys are very crowded not only with pedestrians but with scooters, motorcycles, donkey-pulled carts, and so on. So should you choose a hostel or Airbnb? I’d compare prices first and see where each accommodation is located. Book a hostel if you like being around lots of people 24/7. Book an Airbnb if you want a quiet night’s sleep and a more authentic living experience. If you like walking, skip the taxi from the airport. Marrakesh Menara Airport is less than 5k away from Jemma al-Fnaa. If you like walking and want to save some money, skip the taxis and walk. We walked from the airport to our hostel in the Medina in under an hour. Taking a taxi from the hostel to the airport costs €40-50 (according to another tourist staying in the same hostel). Google Maps works (sort of). Even without a Moroccan SIM, we were still able to use Google Maps to help us navigate. I marked several points of interest on the map before we arrived so we used Google Maps as you’d use a paper map. I wouldn’t recommend using Google Maps’ turn-by-turn directions while walking through the Medina, however, simply because this part of the city is densely-packed. Google Maps seems to have trouble pinpointing your exact location in situations like this. Some locations do take cards but we found it was easier to pay with cash. Some smaller cafes are cash-only and if you’re planning on buying a small souvenir from one of the many souks (aka markets) in Marrakesh, you’ll need cash on hand. Conveniently, you’ll find a cash machine at the airport. I took cash out several times and usually we’d use the machine at Jemma al-Fnaa (located on the side of the pink post office building). Lonely Planet advises visitors to cover their knees and shoulders while in the Medina. That means skip the tank tops and shorts! In general, locals don’t show too much skin even when it’s warm outside. Not only will you stick out like a sore thumb, but you’ll definitely attract more attention (like stares) simply because locals don’t dress like that. This applies to men and women so think twice about the clothes you pack for your trip. Also, check the weather forecast before you arrive. I think people assume Morocco is hot year-round and that isn’t the case. It was nice and sunny during our week there but in the evening it was cold. It’s even colder if you venture out into the desert. This only happened a few times to us but other tourists reported the same scam. The scam goes down like this: a local tells you “X is closed” and then proceeds to offer you directions and/or offers to guide you to wherever you are going. Perhaps the mosque is closed, the palace is closed…whatever you are looking for— it’s closed! The scam is that whatever you are looking for is definitely NOT closed, these “helpful” guides are attempting to confuse you. They’ll offer to help and then demand you pay them in the end. Fortunately, we didn’t fall for this scam but it’s still annoying. As we approached our hostel on our first day in the city, a boy offered to help us. We were right next to the hostel and he told us it was in the opposite direction. Very helpful! We ignored him and walked the few metres to the hostel door. A second time, we were walking back to our Airbnb and were literally right around the corner from the apartment. A young man told us “it’s closed” (even though he had no idea what we are looking for…) and started to walk toward us, offering to help. We ignored him and went to the apartment since we knew what he was up to. Anyway, it’s not like you’ll be bombarded with scammers but I wouldn’t trust anyone who offers to give you directions. They will mislead you and demand you pay them. You have to pay for photos. If someone dressed up in colourful Berber garb offers to take your photo, know that you’ll have to pay him for the service. Actually, if anyone offers to take your photo, expect to pay them. Try negotiating the price first if you really want the photo. Similarly, if you want to film or photograph musicians and other performers, you’ll have to pay them as well. No one can make you pay for a photo of the rooftops! Thanks to Kuba for this photo. I didn’t expect this, but LOTS of people offered to sell us hashish. We’d politely decline, not only because we don’t smoke but we didn’t want to break any laws in a foreign country. Print your boarding pass for your return flight. Marrakesh Menara Airport doesn’t accept digital boarding passes so you’ll need to print it before your flight home. I recommend printing it at Cyber Cafe, an internet cafe located next to Jemma al-Fnaa. We never had issues communicating in Marrakesh. During our trip, we heard French, Arabic, and English regularly spoken by locals. Menus are printed in French and English and waitstaff usually spoke to us in English. It’s helpful (and fun) to know basic greetings in French but it isn’t necessary. They did get a kick out of my Arabic greetings, though! Don’t worry if you can’t speak Arabic. You can get by with English, no problem! Despite what the news wants you to think, Marrakesh is, in fact, safe for tourists. Marrakesh felt just as safe as any other city I’ve visited. I feel that some people view Morocco in a negative light just because it’s a predominately Muslim country in Africa. Some viewers were worried about us travelling to Morocco for a week, but no one was worried about us living in Bosnia and Herzegovina (another predominately Muslim country) for two months. Travelling around Europe for 6+ months by myself didn’t shock anyone (besides some Americans, perhaps—but that’s another story…). I find it ridiculous that anyone would worry about visiting a country like Morocco, though I’m guessing they know nothing about it. Morocco isn’t an inherently violent place and neither are the people who live there. Regrettably, acts of violence occur in every country. If you’re worried about travelling to Morocco, compare crime statistics of Morocco with various other countries, like the US, the UK, or Canada. The truth will surprise you! But what about women travelling alone in Marrakesh? While I didn’t visit Marrakesh by myself on this trip, I’d be happy to revisit Marrakesh or elsewhere in Morocco unaccompanied. Just use common sense and you’ll be fine. Travelling is always more fun when I’m with Kuba. That being said, I’d be happy to visit Morocco again, even if he couldn’t join me. Thanks to Kuba for this photo. 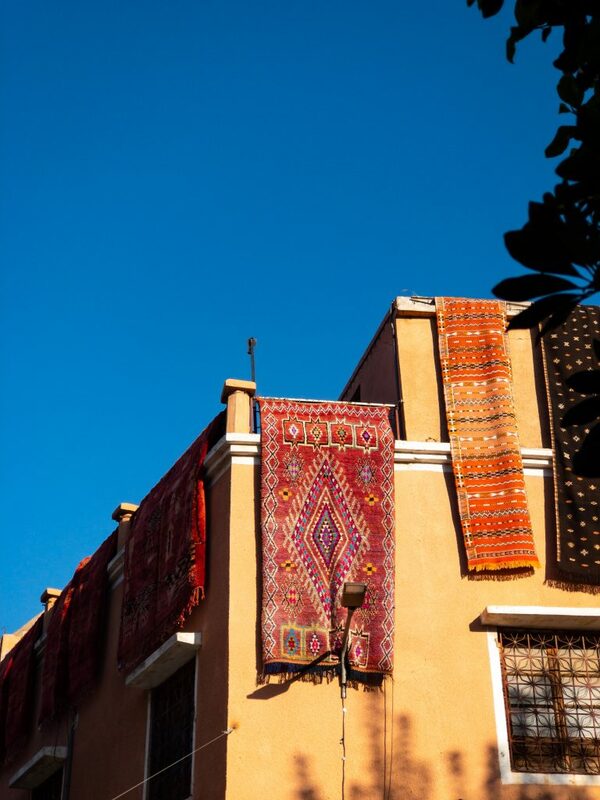 Try Marrakesh for a weekend. If you are lucky to find yourself planning your own Marrakesh get-away, I’d recommend visiting for 2-3 days. A few days gives you plenty of time to acquaint yourself with Morocco’s most visited city. Venture outside of Marrakesh on day trips or travel to another city entirely if you have more time. Don’t forget to check Lonely Planet for recommendations. If you are looking for more information on specific attractions or restaurants, find these locations on TripAdvisor or Google and search through the reviews. I often search for keywords like vegan, soy milk, plant milk, etc. to see if restaurants have vegan options. Thanks for reading! 🙂 Do you have any tips you’d like to share? Also nice to search for washrooms with it! I found you by accident on youtube and you talk about the difference in Europe and living in America. The reason why public transportation in America is not given the resources is because back in the 20s, 30s, and 50s, American rubber, tire, auto, and oil industries conspire to buy up public transportation systems in the cities and counties and then getting rid of them in order to get rid of the competition for their products. In addition, the counties and the cities have never given priority to expanding their public transportation system even though their population grew dramatically. Any government official who spoke out on expanding the publican transportation was probably shut down by the real estate people who wanted the land for more apartment, houses, and businesses. In additions, cities and counties don’t seem to work with each other to connect their lines so people don’t have to drive their cars considering the fact that the business leaders keep moving their places from one location to another one thus forcing people to get up very early in the morning to get to work. Looking forward to getting updates like you. I wish I could be like you and go around the world.